• Exquisite design technology, adopt unique hexagonal honeycomb to protect the stability of leg and knee muscles. • With honeycomb compression pad design to protect leg and knee against impact, as well with anti slip band, no easy to fall off. 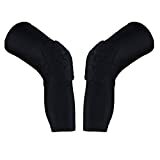 • The fabric is bibulous and good breathable, protect the leg and knee from pulling during in outdoor activities such as basketball, football, baseball, cycling, golf. • You should read the description and size specification carefully before buy this product. Material: high quality soft & elastic polyester fabric.